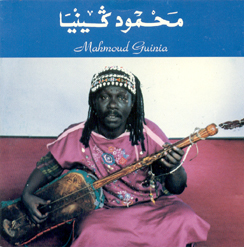 Maâllem Mahmoud Guinia (the King) or Gania (actual spelling in passport). He is the son of the late Maâllem Boubker Gnaia, and his two brothers Abdelah and Mokhtar are also distinguished maâllemin (masters). The Gania Family does also include Zaida Gania, who is a very popular medium and clairvoyant at the nights of trance (leelas) as well as the head of a group of female gnawas, The Haddarate of Essaouira. tradition with its special mix of African and Arabic elements and gnaoua rituals combines both music and acrobatic dancing to create an atmosphere of trance and healing. 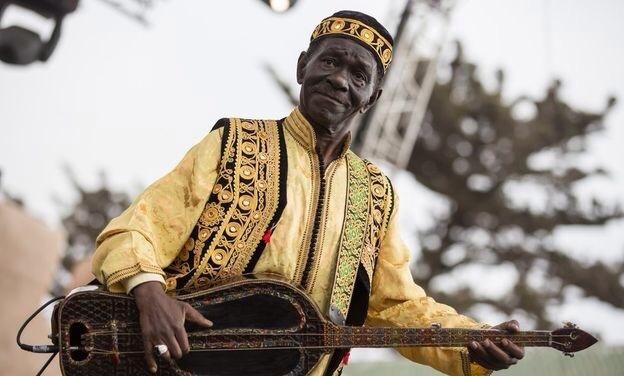 The Gnawa religious brotherhood are the descendants of West African slaves who were brought northward, but they claim their spiritual descent from Bilal al-Habashi, the Ethiopian who served as the Prophet Muhammad's first muezzin, a person who calls the Muslim faithful to prayer. The most important gnaoua ritual is the lila (also called a derdeba), an all-night, healing trance ceremony led by a maâlem, or master musician. Here the seven spirits are evoked through around 100 chants. Especially in the Muslim month of Sha'aban, which is just before Ramadan, there are "leelahs" held in the gnawa community.
" C’était un personnage très impressionnant, un monument, ardent défenseur de la culture gnaouia, c’est grâce à des gens comme lui que cette culture a (sur)vécu quelques siècles. " "It was a very impressive character, a monument, an ardent defender of Gnaouia culture. it is because of people like him that this culture (of) lived a few centuries."